Number and Questions: For this write the question in English for which you are asking the answer. Write the question briefly. Suppose your question is whether Tina will marry you? 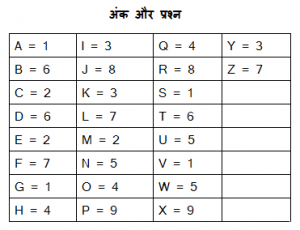 Write the name Tina and add the numbers as per the table given below. W I L L T I N A M A R R Y ME? This number 9 is a mysterious number. Now we will write 9 and thereafter the numbers from which 9 is detected. On the last line we added 9 and 4, it became 13 and 13 became 1+3=4 similarly added 4 and 6 result comes 1, again 6+4=10=1 then 4+4=8. So last but one line became 4118. Repeated the process and at the top we got 9. The answer is that number 9 is the favorable number and you can expect for a good fortune. If the work done not immediately but it is sure in future you will get the things done. Please wait for the time when all your work will be done and you will be successful. 1. Your fortune is good. The most of the effects of the planets are favorable to you. But a little malefic effect is also foreseen. Keep on working and wait for the right time. -Number and Questions. 2. There are hurdles but not like that which could not be overcome. Try to remove the obstacles and you will be successful. 3. If you are unable to do hard work, you should not expect success. If you think too much nothing could be achieved. If you have to take risk, take it. Don’t think much. -Number and Questions. 4. Whatever you want you will get it and it is sure. The supports you are getting accept it. Don’t deny. Do everything bravely and do it sincerely. 5. You should keep trust that you will be successful. You will achieve your target. You will be helped from a friend suddenly. 6. Don’t be influenced by others, keep trust on you and do your work by your intellect and keep faith on your work, you will be happy. But do not expect more than your work. If your demand is reasonable, it will be fulfilled. -Number and Questions. 7. Your near future is not clear, it is hazy. There will be many problems on the way. You may face financial loss or a bad name especially when you are dependent on others. But the time will change. The bad days will be over. 8. Your desire will be fulfilled only when you are honest to your work. Be honest to your ideals. If you determined to get the things done in your favor, you will achieve that. Whatever your discretion says do it accordingly. -Number and Questions. 9. Most of the planets are favorable to you. Expect for the fortune. If immediately you do not get the success, in near future it will be successful. You just wait for the good time. 7. निकट भविष्य धुंधला है, रास्ते में बहुत कठिनाइयां है। आपको दुर्भाग्य, आर्थिक हानि और बदनामी का सामना करना पड़ेगा, विशेषकर जब आप दूसरों पर निर्भर हो। परन्तु सदा ऐसा नहीं रहेगा, संतोष रखिये। बुरा समय गुजर जाएगा। -Number and Questions. 9. आपके ग्रह आपके अत्यंत अनुकूल है। सौभाग्य की आशा रखिए, यदि कार्य तुरंत नहीं हुआ तो कार्य निकट भविष्य में अवश्य ही होगा। अपनी सफलता, कार्य सिद्धि, आर्थिक लाभ और उन्नति के लिए समय का इंतज़ार करिये। -Number and Questions.